Amber and Logan's wedding was far more emotional than I expected, considering I have photographed numerous weddings, and always tend to tear up during the ceremony. And honestly, I am so honored that I was a huge part of documenting this special day. As crazy as it sounds, their wedding put things into perspective for me. You really have no idea what tomorrow holds. But, I hold firm in my belief that miracles happen every day; Amber, Logan and their beautiful baby girl are a product of just that. With everything they went through leading up to their wedding, I am almost positive their marriage can withstand anything. The two exchanged their vows amongst friends and family at Barnwell State Park in Blackville, South Carolina (Orangeburg).The spot they chose overlooked beautiful Toby Creek, under a gorgeous arbor, that was handmade for the wedding. The theme consisted of a rustic feel with gorgeous rose gold accents, gold and sequined decor. It was truly a rustic, fairy tale wedding. It was a warm, yet breezy day, and the whole day came together perfectly. 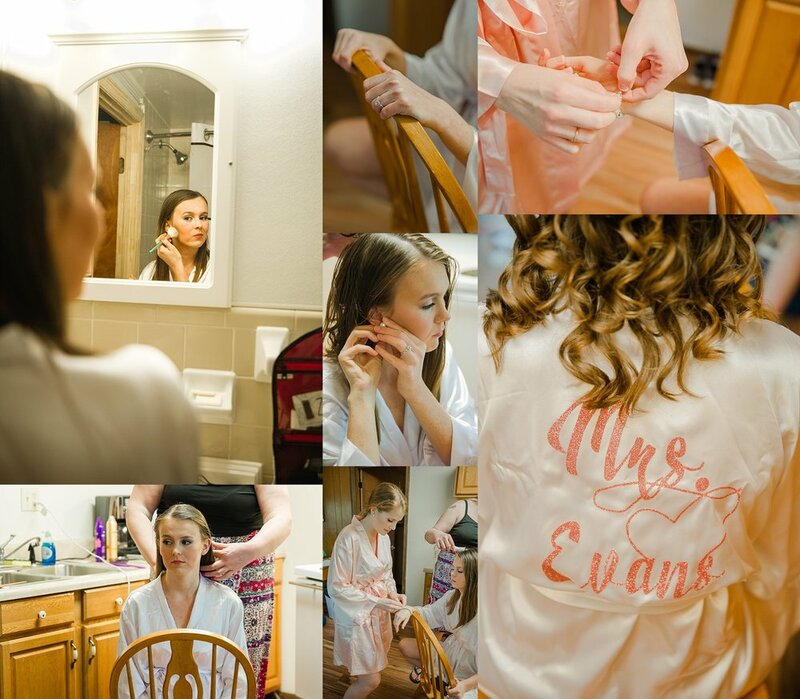 The bridesmaids were stunning in their rose colored, mismatched Adrianna Papell gowns. If you are planning a wedding and are stuck on how to dress your many bridesmaids, this makes for a fabulous option. Most lines carry gowns in the same color scheme, but the gowns have different bone structure for all body types! I wish I had known this when I got married a few years ago! I love the idea and style for sure. 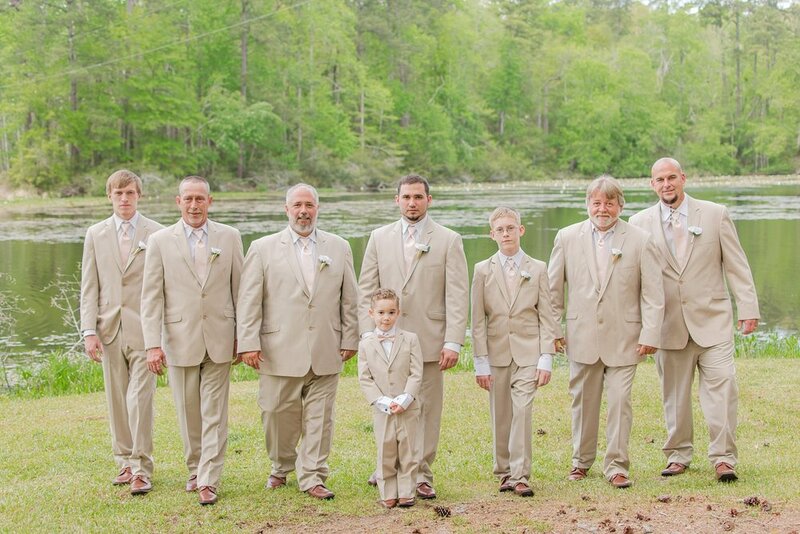 Logan and his groomsmen were dressed to the nines in their tan suits and jackets from Catz Formals, which is such a classic, southern wedding look. Amber's white, trumpet gown, also from Catz Formals, was sensational; it was covered in lace from neck to toe, embellished with gorgeous beading around the waist and neckline, and featured a stunning train. Amber included a beautiful beaded veil to compliment the gown, and kept her jewelry simple and sophisticated with pearl earrings and bracelet. The reception took place inside the community center at Barnwell State Park. The columns were wrapped in white fairy lights, and the tables covered in rose gold sequin runners, along with sliced wood centerpieces and touches of florals. All of the gorgeous florals used throughout the day were handmade by Amber's mother. The food was catered and made with love by Logan's mother, with the help of Dillon Evans, and it was so delicious! I absolutely love when family comes together and adds their own touches to such a special occasion. 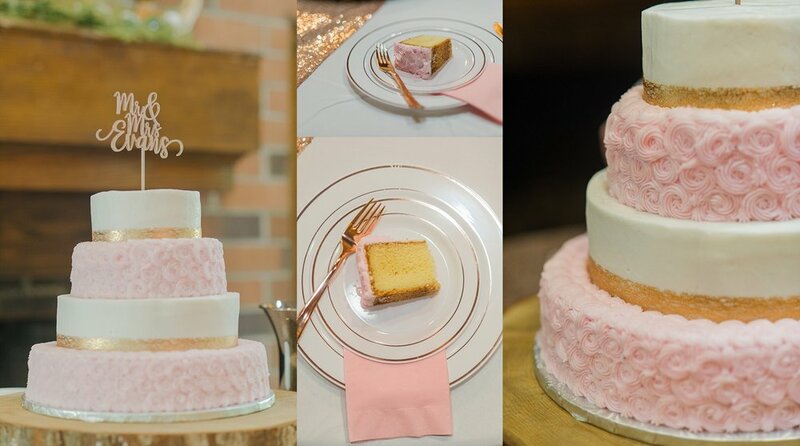 And y'all, the wedding cake, my absolute favorite thing about a wedding day, was amazing. It was baked and decorated by Joann Zeigler. It was hands down one of the BEST cakes I have ever eaten at a wedding. (& Hattie Leigh agreed. haha!) Guests danced to great music provided by a DJ and they had a good time on the dance floor. At the end of the night, Amber and Logan were sent off through a tunnel of sparklers formed by their guests! It was magical and beautiful! 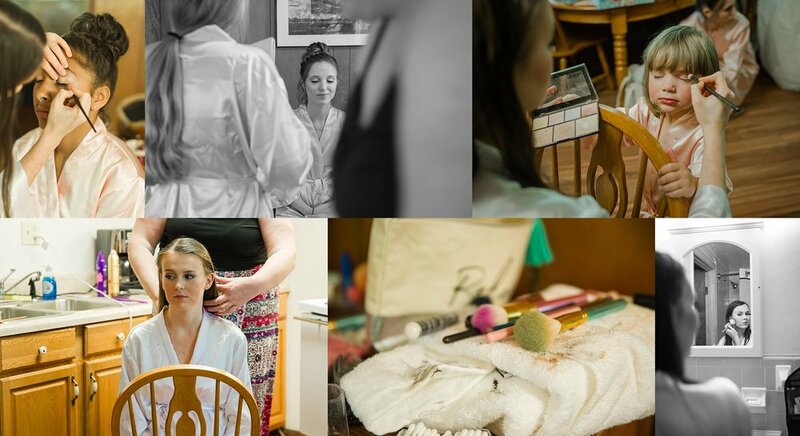 Check out some of the highlights from their big day below! And feel free to leave a comment or words of advice for the newlyweds!